Research scientist Galen Erso and his family are in hiding on the planet Lah'mu. Imperial weapons developer Orson Krennic arrives to press him into completing the Death Star, a space station-based superweapon capable of destroying planets. Galen's wife Lyra is killed in the confrontation while their daughter Jyn escapes and is rescued by Rebel Saw Gerrera. Fifteen years later, cargo pilot Bodhi Rook defects from the Empire, taking a holographic message recorded by Galen to Gerrera on the desert moon Jedha. 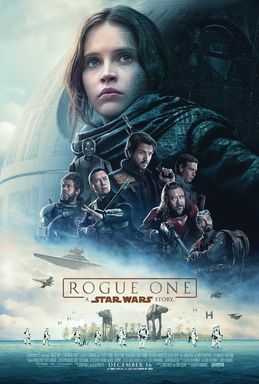 After learning about the Death Star from an agent at the mining colony Ring of Kafrene, Rebel intelligence officer Cassian Andor frees Jyn from an Imperial labor camp at Wobani before bringing her to the Rebel leader Mon Mothma, who convinces her to find and rescue Galen so the Alliance can learn more about the Death Star. Cassian is covertly ordered to kill Galen rather than extract him. Read more on Wikipedia.